The third Mahan (DLG-11) was laid down 31 July 1957 by the San Francisco Naval Shipyard; launched 7 October 1969; sponsored by Mrs. H. P. Smith wife of Vice Adm. H. Page Smith; and commissioned 25 August 1960 Comdr. Wm. S. Busik in command. During the first year and a half of her commissioned service Mahan's primary assignment was the testing and evaluation of her weapons systems ASROC and Terrier missiles. A unit of the Pacific Fleet's Cruiser-Destroyer Force she operated out of San Dieg o participating in local and fleet exercises off the west coast and in Hawaiian waters. Leaving San Diego 6 June 1962 she commenced her first western Pacific deployment. For the nest 6 months she cruised with other units of the 7th Fleet taking part in antisubmarine antiaircraft and amphibious exercises as well as making good will calls on ports in the Far East. Included in these latter visits was a stop at Saigon 24 to 28 October for the Republic of Vietnam's Independence anniversary celebrations. 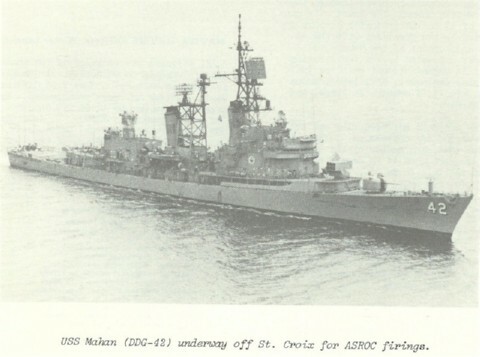 1963 brought Mahan's entrance into the standard schedule of the Pacific Fleet beginning with a shipyard overhaul at Long Beach Naval Shipyard. Following her yard period she conducted training exercises off the west coast She then departed San Die go 6 August for deployment in the western Pacific. In addition to assignments in Japanese and Philippine waters she spent on this tour a total of 4 weeks cruising off South Vietnam before returning to California 10 March 1964. Remaining on the west coast until late 1965 the guided missile frigate underwent a 5-month overhaul 1 May to 20 October followed by test and training exercises and a demonstration of her antisubmarine warfare capabilities before members of the United S tates-Canadian Military Cooperation Committee 9 December. During the summer of 1965 she embarked midshipmen from the Naval Academy and various NROTC units for summer training. Departing San Diego 19 October she sailed to Pearl Harbor for antisubmarine t raining operations and then continued on to the western Pacific arriving at Subic Bay 22 November. Mahan operated with the 7th Fleet spending alternate monthly periods on patrol off Vietnam until returning to California in April 1966. Upon arrival at San Diego 28 April Mahan continued her previous west coast activities local and fleet training operations missile firing exercises at the Pacific Missile Range and as during the summer of 1965 the training of midshipmen during June and July. August brought the installation of a helicopter flight deck. The period 1 December 1966 through 4 June 1967 again saw Mahan In the western Pacific where as before she operated off Vietnam patrolling and providing gunfire support in the fight to prevent the aggressive spread of communism. Arriving back at San Diego 17 June Mahan sailed on 31 July to represent the Navy at Seattle's annual Sea Fair. Following further coastal operations she entered Long Beach Naval Shipyard 1 November for overhaul. This was completed late in April 1968 and Mahan remained off the west coast until departing for the western Pacific in August. She remained as a part of the 7th Fleet into 1969.